The most interesting juxtaposition in market data happened this week. Apple announced 9 million units of the iPhone 5s/c sold in their opening weekend while BlackBerry recognized 3.7 million smartphones sold in the three months ended August 31. I will state these data points with a different emphasis: while Apple explicitly reported, both in a press release and in an SEC filing, Sales of 9 million units, BlackBerry reported recognition of revenues on 3.7 million units. At the same time BlackBerry also reported sales to end users of 5.9 million units. So, did Apple sell 9 million iPhones in three days? What about units ordered and not delivered? Which of these units will show up in the company’s income statement? 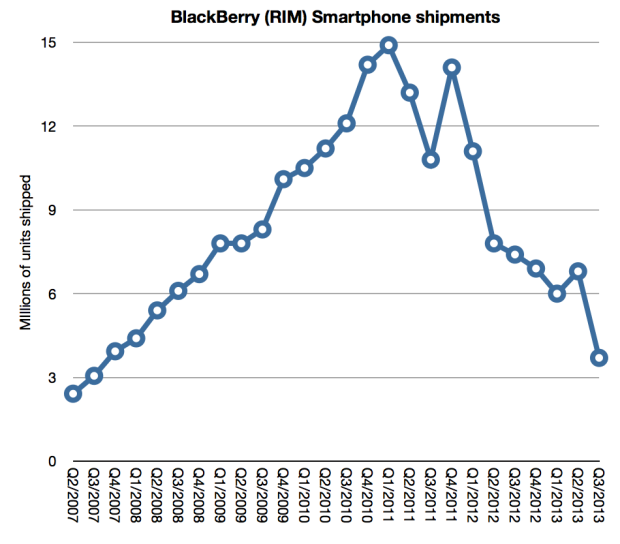 Conversely, did BlackBerry sell 3.7 million or did it sell 5.9 million smartphones in three months? The answer is dependent on what constitutes a sale. I suggest re-reading the Sold and Shipped: A Brief Introduction post from last year. Understanding is complicated by many factors, not least of which could be intentional signaling by management. We may never come to a perfectly matched comparison of the two companies’ situations but our job as analysts is to see through the signals and obfuscating language and interpret a pattern. A pattern that extends over a time and helps us learn. My observation is one of contrast. The juxtaposition this time is that Apple emphasized sold and not shipped while BlackBerry sold more units to end users than it recognized revenue. These signals reflect precisely the inverted fortunes of the two companies. During the second quarter the company recognized hardware revenue on approximately 3.7 million BlackBerry smartphones. Most of the units recognized are BlackBerry 7 devices, in part because certain BlackBerry 10 devices that were shipped in the second quarter of fiscal 2014 will not be recognized until those devices are sold through to end customers. During the quarter, approximately 5.9 million BlackBerry smartphones were sold through to end customers, which included shipments made prior to the second quarter and which reduced the Company’s inventory in the channel. The company is essentially saying that due to the unusual circumstances of a product launch failure, they will change how they account for their business. They don’t have the confidence that units shipped will actually sell and will not recognize them since they fear they will have to write some off. They are signaling: They are being far more conservative, not reporting shipments alone because those shipments could essentially be value free. When seen as a pattern, the new figure on recognized revenue units needs to be shown relative to the history of recognized revenue units. You can see the instability in volume recognition in the graph as a clue. Product launches cause erratic changes in what was previously a seasonally stable business. This is, essentially, the company being thrown onto its back foot. It is staggering from an unexpected blow and resetting expectations. Apple also offers “channel inventory” data on select products. This inventory data, when coupled with shipment data, offers insight into how many units are actually purchased by end users. If Apple runs a tight ship then its inventory is relatively low but if it has a reliable customer base that of its channel is also low. Moreover, if it can predict sales well then it avoids overfilling the channel and having to take a hit while draining it. On September 23, 2013, Apple Inc. […] announced that it has sold over nine million new iPhone 5s and iPhone 5c models, just three days after the launch of the new iPhones on September 20. Apple expects total company revenue for the fourth fiscal quarter to be near the high end of the previously provided range of $34 billion to $37 billion, and expects gross margin to be near the high end of the previously provided range of 36% to 37%. The reporting of sales after a launch weekend has been a staple of Apple’s communications about product for a long time. Therefore the evaluation of this performance should be made in comparison with previous launches. But it’s not necessarily a statement of end user purchases. Nor is it a statement purely of shipments. The term “sold” as used in a press release is not an accounting term and it is not something which is meant to be audited. However, none of that matters. The signal is what should be observed. By deliberately and repeatedly using the word “sold” Apple is expressing confidence that demand for its products is strong. Sure, there is channel inventory in that 9 million unit number but there are also ordered devices which have not been shipped and thus are not counted as sales. There are also depleted store shelves and people angry about not getting their desired phone model. Apple knows this, Tim Cook is making it clear they know this. They have excellent visibility into the distribution of their products. They have excellent inventory management. They are typically conservative in their financial reporting. So why would anyone interpret Apple’s release as a negative signal? If you want an example of a negative signal, look at how BlackBerry reported its launch performance. When interpretation of a signal is very different from the literal statement, it says more about the interpreter than about the company.